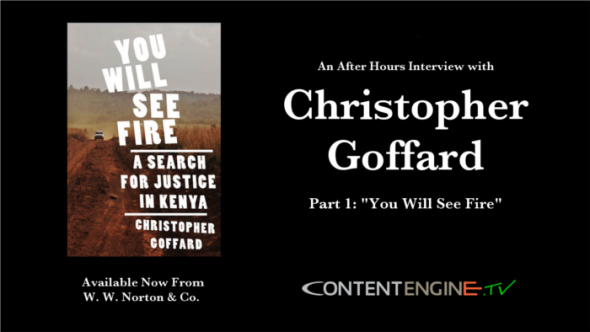 ContentEngine.tv brings you an After Hours interview with Pulitzer Prize-winning journalist and author, Christopher Goffard. Christopher discusses his new work of non-fiction, “You Will See Fire,” which was recently published by W.W. Norton. Chris is a reporter for the Los Angeles Times and the author of a novel, “Snitch Jacket,” which was nominated for an Edgar Award. 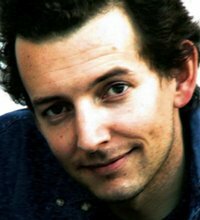 Staff writer for the Los Angeles Times, Christopher Goffard is not only an established reporter, but a talented novelist. He channeled his experience covering courts and cops into his first novel, SNITCH JACKET, which earned an Edgar Award nomination for best first mystery. That novel, along with a number of his LA Times stories have been optioned for feature film adaptation. His second book, YOU WILL SEE FIRE, is a non-fiction investigation into one man's search for justice in Africa. Chris’ incisive journalism and stylistic flair have landed him numerous awards. Last year, he was part of the journalistic team awarded the most prestigious Pulitzer Prize – the public service award – for investigative work on the city of Bell’s salary scandal, coverage that also won the Seldon Ring and George Polk Award.